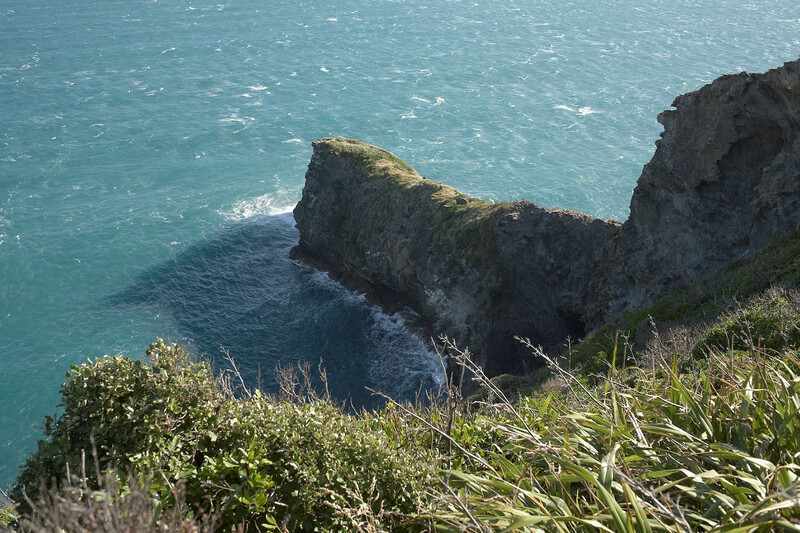 Titi Island is a 32 hectare slab of schistose tuff and sandstone tilted upwards towards the north, with a moderately steep forested slope opening up to a breathtaking façade of high cliffs overlooking Cook Strait. 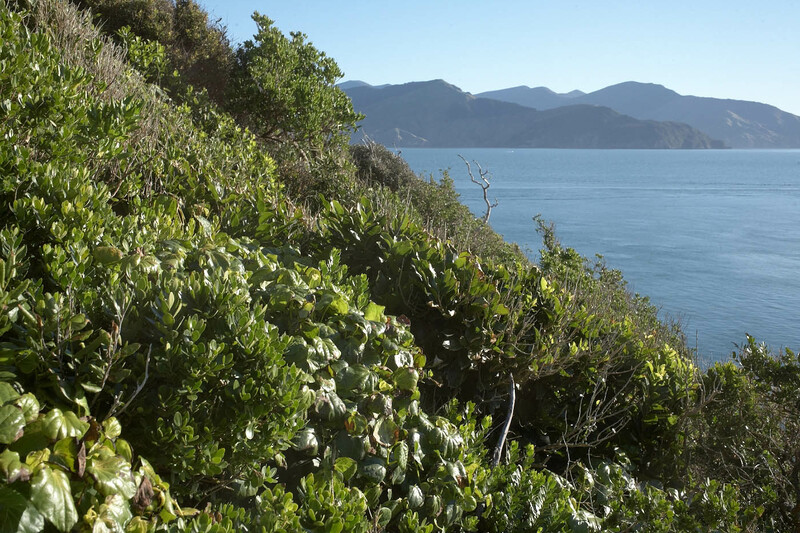 Shearwater surveys on the island in January provided an opportunity to record local plant communities. A summary of the vegetation zonation is given here. View from the ridgetop of Titi Island looking west. Chetwode islands in the middle distance, d’Urville, Wakaterapapanui and Stephens islands on the horizon. Photograph by Jean-Claude Stahl, Te Papa. South slope of Titi Island. Photograph by Jean-Claude Stahl, Te Papa. On the southern slope facing the mainland, dry ridges of broken sandstone alternate with gullies where deeper soil is heavily burrowed by shearwaters (sooty and flesh-footed). On ridges, the vegetation sequence above the fringing low cliffs starts with a herbfield of native ice plant (Disphyma australe) and glasswort (Sarcocornia quinqueflora), festooned by a narrow band of silver tussock (Poa cita). 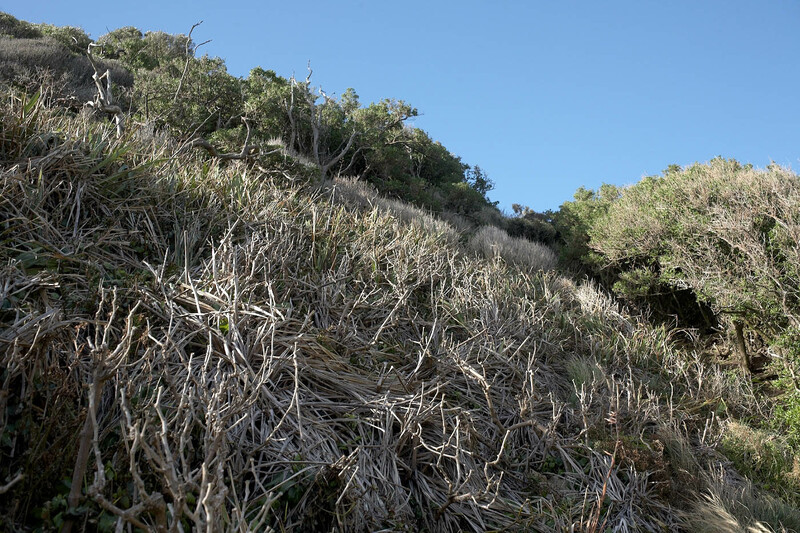 Above that, thickets of saltburned mountain flax (Phormium cookianum) and kawakawa (Macropiper excelsum) extend upwards to a windshorn taupata (Coprosma repens) scrub fringed by mahoe (Melicytus ramiflorus) and its shrubby relative Melicytus obovatus. Herbfield of native iceplant and glasswort (lower right), silver tussock (upper right) and saltburned Cook’s scurvy grass below taupata scrub (left). Photograph by Jean-Claude Stahl, Te Papa. Flax and kawakawa thicket below taupata scrub. Photograph by Jean-Claude Stahl, Te Papa. 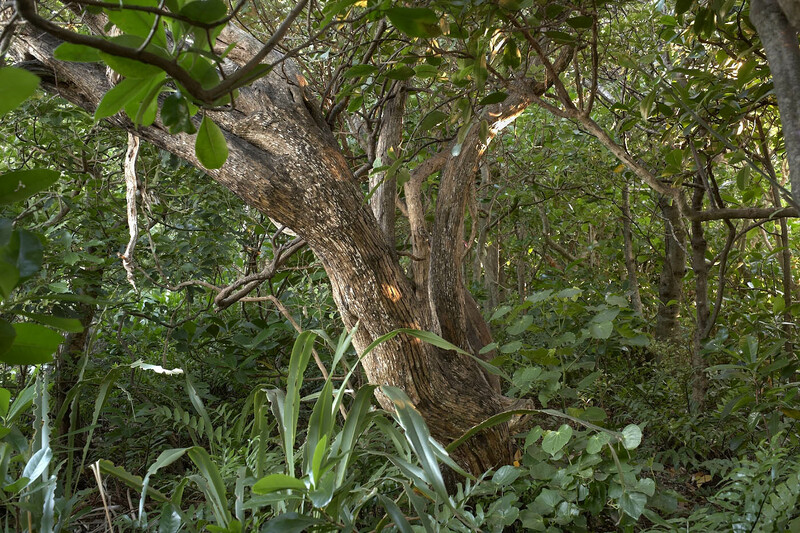 Melicytus obovatus (left) at the transition between flax and kawakawa thicket and taupata scrub. Photograph by Jean-Claude Stahl, Te Papa. Higher up on ridges, the taupata scrub grades into a low dry forest dominated by akiraho (Olearia paniculata) and large-leaved milk tree (Streblus banksii), both of often impressive girth, and with scattered karaka (Corynocarpus laevigatus), fierce lancewood (Pseudopanax ferox), and titoki (Alectryon excelsus), the latter only in the western half of the island. 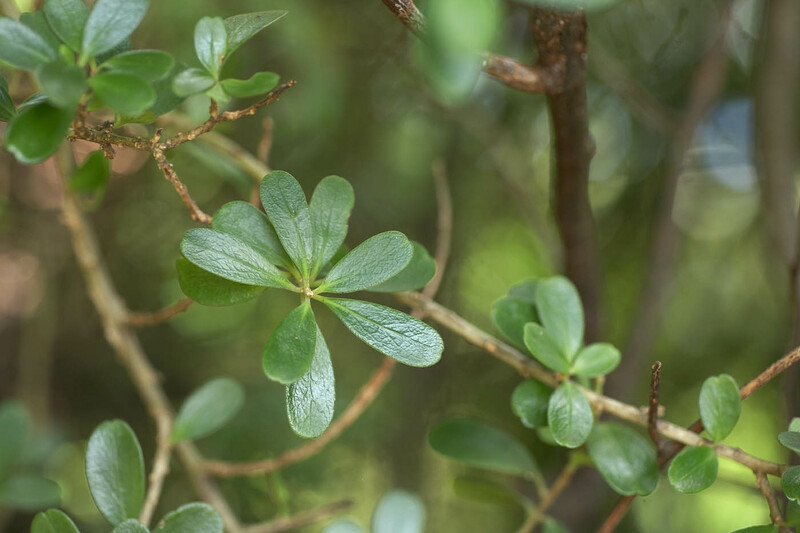 Sometimes thick undergrowth of kawakawa and red mapou (Myrsine australis) laced with New Zealand jasmine (Parsonsia sp) and pohuehue (Muehlenbeckia australis) can make progress rather unpleasant. Occasionally, this dry ridge forest opens up into patches of mountain flax with a few scattered cabbage trees (Cordyline australis). 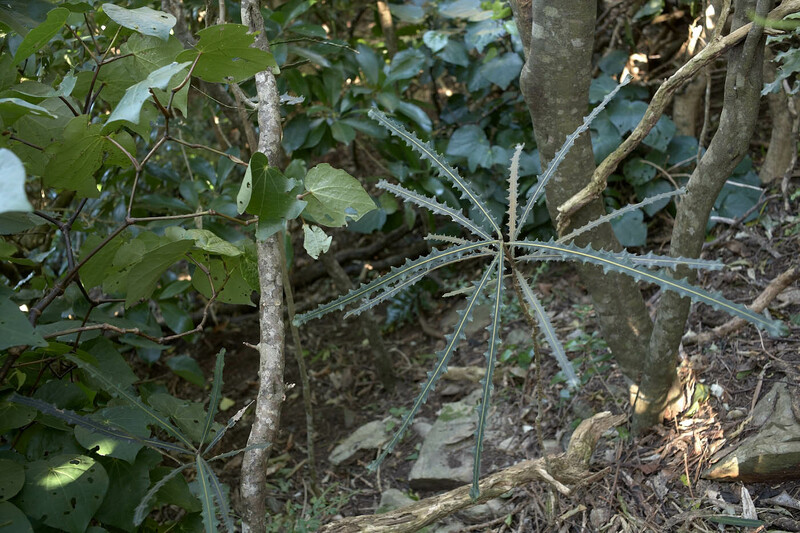 Dry akiraho ridge forest with undergrowth of kawakawa, mountain flax and shining spleenwort. Photograph by Jean-Claude Stahl, Te Papa. Photograph by Jean-Claude Stahl, Te Papa. Juvenile fierce lancewood in dry ridge forest. Photograph by Jean-Claude Stahl, Te Papa. 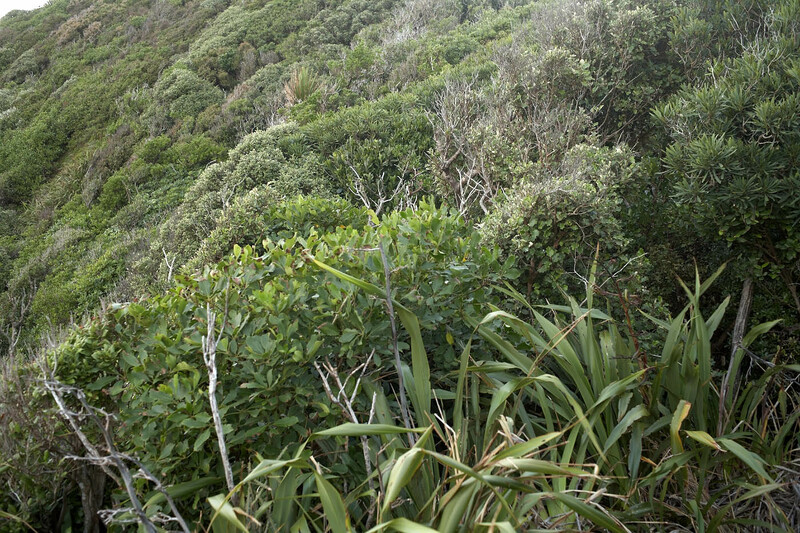 Large-leaved milk trees (light trunks) and karaka (foliage on left and right) near the ridgetop. Photograph by Jean-Claude Stahl, Te Papa. The vegetation zonation is quite different along gullies, starting with a salt sprayed herbfield of New Zealand celery (Apium prostratum) and shore groundsel (Senecio lautus), then of lush blue wheatgrass (Anthosachne solandri) and Cook’s scurvy grass (Lepidium oleraceum) growing on the run-off from the shearwater colonies upslope. This herbfield abuts onto a taupata forest at first totally devoid of undergrowth, but soon invaded by a thick ground layer of shining spleenwort (Asplenium oblongifolium) higher up. 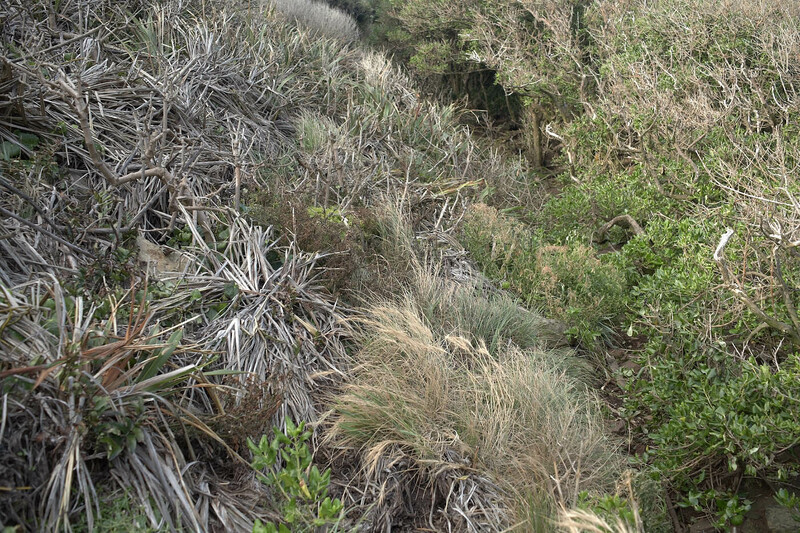 Band of blue wheatgrass (centre foreground) and Cook’s scurvy grass (centre mid-distance) at the transition between mountain flax thicket (lefthand slope) and taupata forest (righthand gully). Photograph by Jean-Claude Stahl, Te Papa. 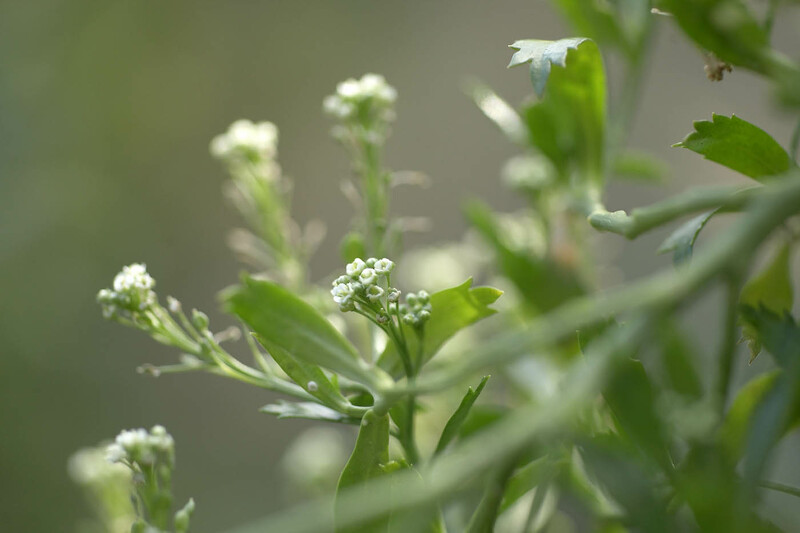 Cook’s scurvy grass. Photograph by Jean-Claude Stahl, Te Papa. Taupata forest at the base of a gully. Photograph by Jean-Claude Stahl, Te Papa. 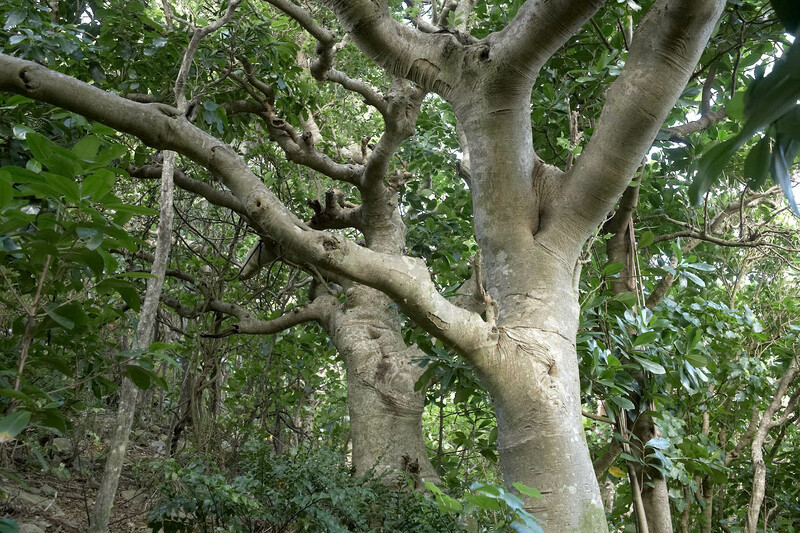 The tallest forest is found in the mid to upper catchments of the gullies, where taupata is replaced by a wharangi (Melicope ternata) and pigeonwood (Hedycarya arborea) dominated forest, with scattered mahoe and five finger (Pseudopanax arboreus). 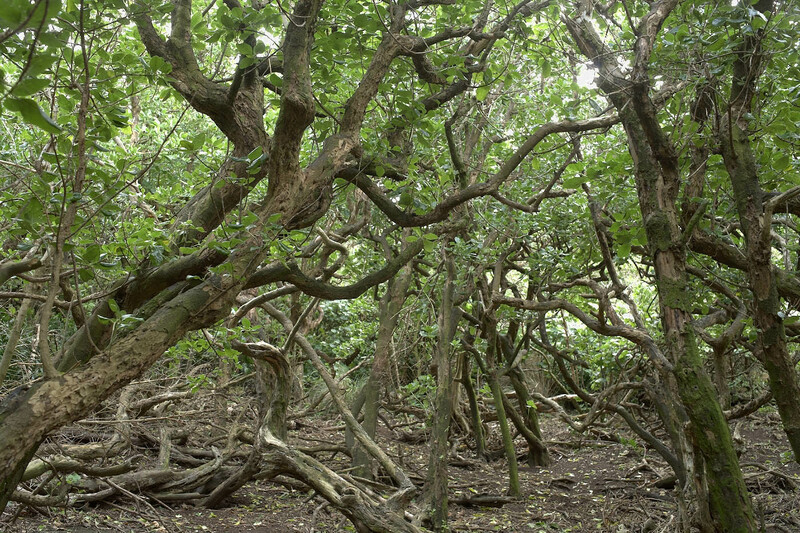 In this forest type, barren ground coinciding with the densest shearwater colonies alternates with thick groundcover of shining spleenwort and tree nettle (Urtica ferox). 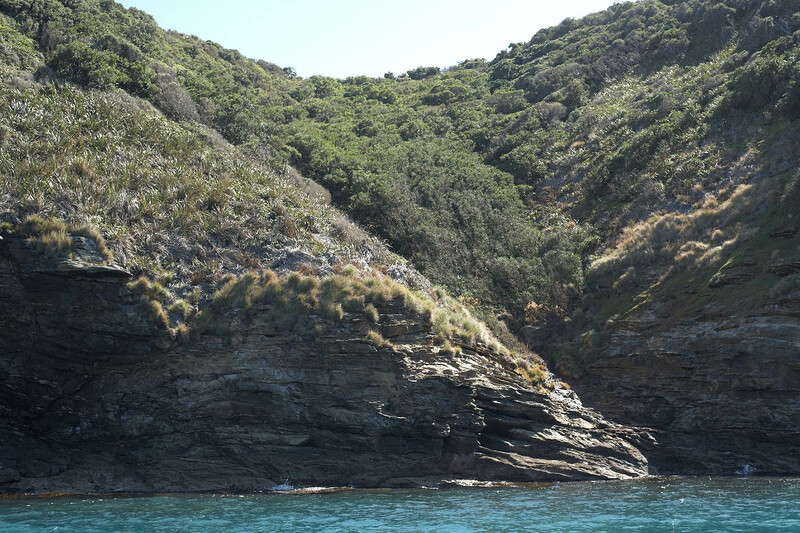 The transition between gully and ridge forests is generally marked by a belt of kohekohe (Dysoxylum spectabile) and karaka. Seedlings of karaka are conspicuously confined to the footprint of the parent tree, as there are no pigeons on the island to disperse the seeds. The local karakas also have markedly smaller fruits than those seen in the Wellington region. 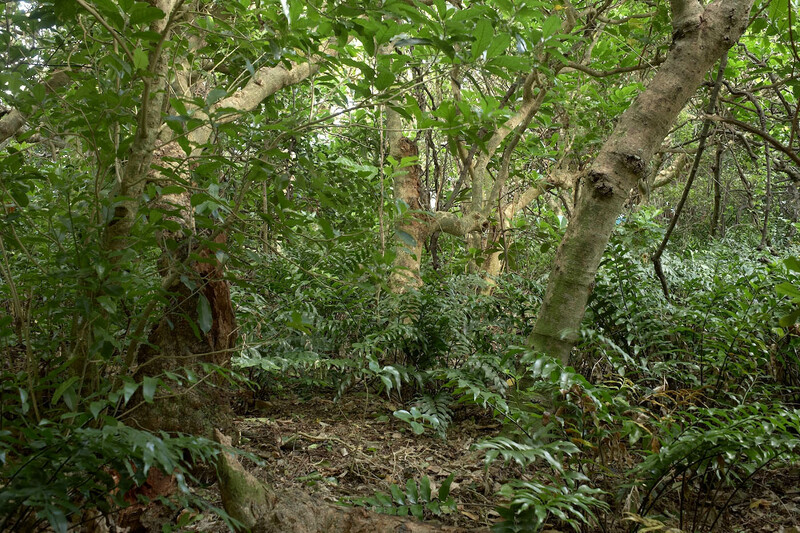 Wharangi and pigeonwood forest with barren shearwater colony (foreground) and understorey of red mapou, tree nettle and shining spleenwort (background). Photograph by Jean-Claude Stahl, Te Papa. Kohekohe forest with undergrowth of shining spleenwort at the transition between ridge and gully forests. Photograph by Jean-Claude Stahl, Te Papa. 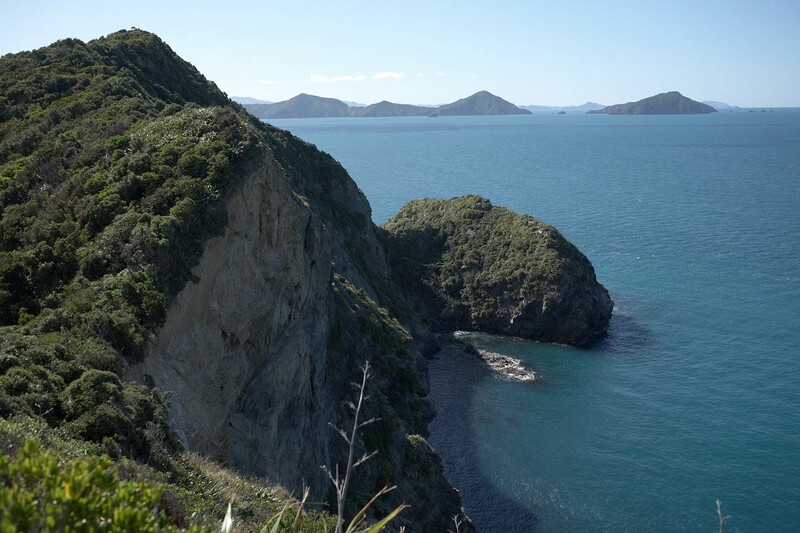 The vegetation again changes when reaching the “skyline” of the island, where dry akiraho and milktree ridge forest abuts onto a tight windswept scrub or low forest that fringes the high north facing cliffs, with a band of Melicytus obvoatus marking the transition. The windswept clifftop scrub is a tight mosaic of ngaio (Myoporum laetum), fierce lancewood, five finger, akiraho, kowhai (Sophora sp.) and native broom (Carmichaelia sp.). Sparse mountain flax, silver tussock and taupata grow on the cliff faces below, with denser stands of those same plants on the top of promontories at the base of the cliffs. All in all a remarkably diverse island despite its modest size. 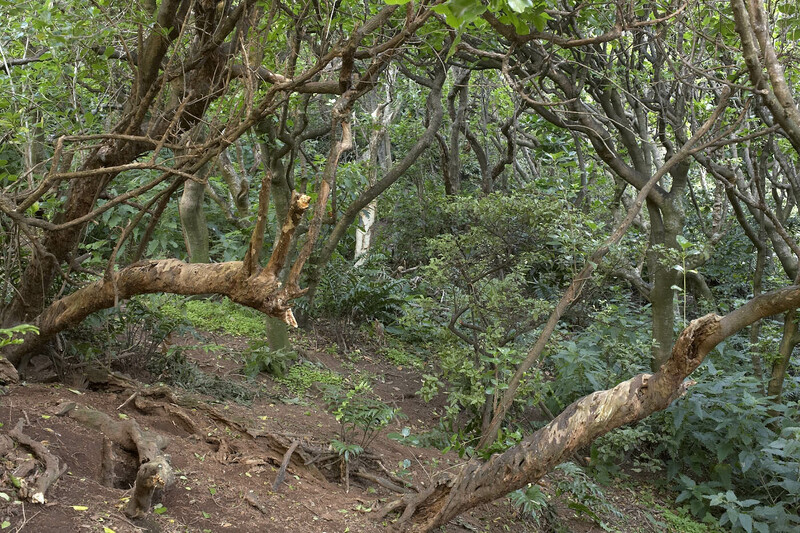 Melicytus obvoatus on the ridgetop. Photograph by Jean-Claude Stahl, Te Papa. 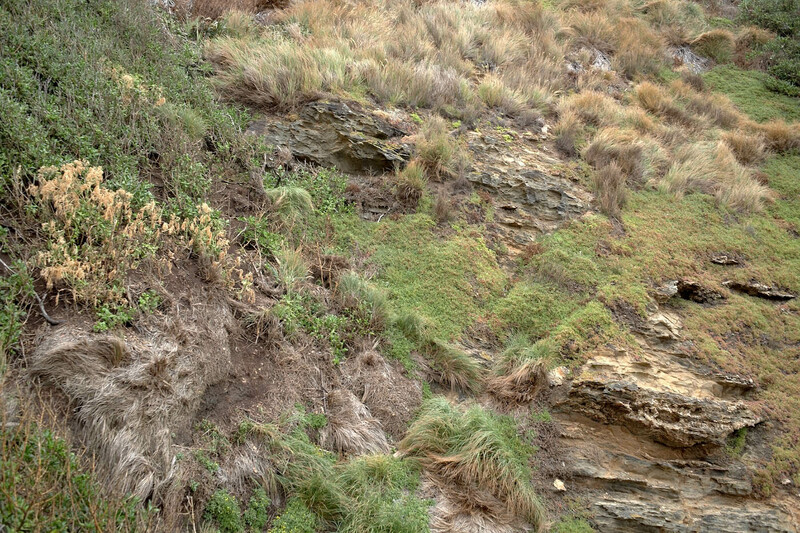 Windswept scrub of mountain flax, five finger, akiraho and fierce lancewood on a north facing clifftop. Photograph by Jean-Claude Stahl, Te Papa. Promontory on the north coast with silver tussock, mountain flax and taupata. Photograph by Jean-Claude Stahl, Te Papa. By Jean-Claude Stahl, Te Papa, with thanks to Dominique Filippi and the staff of DoC Havelock for their support with trip logistics. Hi Jean-Claude Stahl, your photography is awesome. Thanks for sharing such a wonderful island with us. Its very rare to find such a place with various kinds of shrubs, herbs and plants.